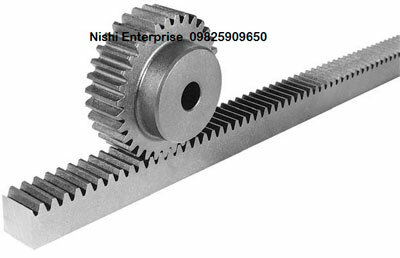 Here at Nishi Enterprise, we offer superior quality integral pinion gears that can be used in a wide range of applications in the sponge iron plants. Our pinion gears have got running capacities of 100TPD, 50TPD, 350TPD, 300TPD and 500TPD. Our products also offer functionalities that are vital for integral pinion shafts for the cement plants and ball mills. We deliver pinion and pinion assemblies which can be used in various types of industrial sectors, such as phosphate mining plants, Kaolin-Bentonite plants, alumina plants and others. We can also create custom design products based on the finishing specifications that are required by our customers. We also specialize in designing, manufacturing and supplying of custom and standard versions of machine cut racks and pinions in both helical and spur tooth forms in Cast Steel, M.S., Bronze, C.I., Hylum as well as many other materials according to specifications. The overall length of the continuous racks can go as high as 2500 mm. We have got a facility thoroughly dedicated for high grade precision work. Our pinion and rack cutting solutions are available in diverse volumes and can be availed at the most competitive prices. We also maintain top quality at every step of the way. We design and manufacture products that belong to an extensive range. This means that whether you have a low end or a high end project, you can use our products for the maximum efficiency. Since we always make use of the finest quality raw materials to create our integral pinions gears rack and pinions, you can be sure of the functional efficiency of our products. We always implement stringent quality checks before we approve any product for sales. Our engineering team members always adopt a flexible approach to their work. This makes it possible for them to come up with excellent products for any kind of custom orders. All our integral pinions gears rack and pinions are compliant with global quality standards. Over the years, we have established ourselves as one of the premier designers and manufacturers of top grade pinions gears rack and pinions in India. Our products are also available at the most affordable prices. 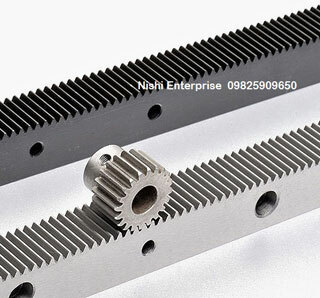 So consult us at Nishi Enterprise today for the finest quality pinions gears rack and pinions.